On October 1, 1982, The Walt Disney Company opened its EPCOT Center to the world, heralding changes that would take the Disney property in Florida from a mere theme park to a world-class resort destination. Authors Steve Alcorn and David Green were there, as employees of Disney's WED Imagineering. 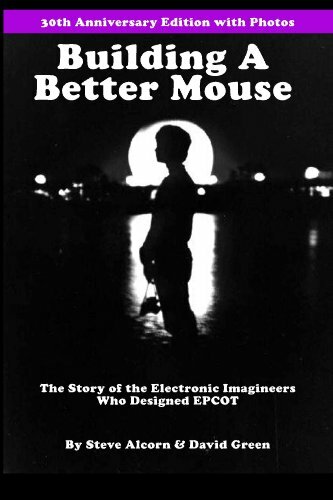 "Building a Better Mouse" is the story of the Electronic Imagineers who designed EPCOT Center. It tells the tale of the "hundreds of mostly young, mostly bright and all embarrassingly idealistic people" who worked on Epcot, and gives a unique insider's perspective on what it was like to be in the trenches as a Disney Imagineer in the early 1980s, from pixie dusting - when new employees are indoctrinated into all things Disney - through the craziness of the engineering design process, right up until the last frantic dash to opening day. It is a breathtaking, breezy, E-ticket ride of a book, required reading for both hard-core Disneyphiles and people interested in the business side of themed entertainment.